27 March, 35.4C at 11.28am. At 11.00am it was 34.4C and at 11.30 am it was 34.8C. No flights near 11.30am. 29 March, 35.2C at 12.12pm. At 12 noon it was 33.8C and at 12.30pm it was 34.7C. No flights at this time. 31 March, 40.1C at 1.17.pm. Just 2 flights arrived between 1.10pm and 1.15pm. This with SSE winds, pushing jet exhaust on arrival direct from terminal to BoM instruments. At 1.00pm it was 38.9C and at 1.30 it was 39.3C. Then 40.2C at 1.42pm, and 39.8 at 2.00pm. Departures at 1.50pm and 2.00pm, taxiing down the runway at Maximum temperature. Then 40.8C at 2.24pm, wind move from SE to now East. 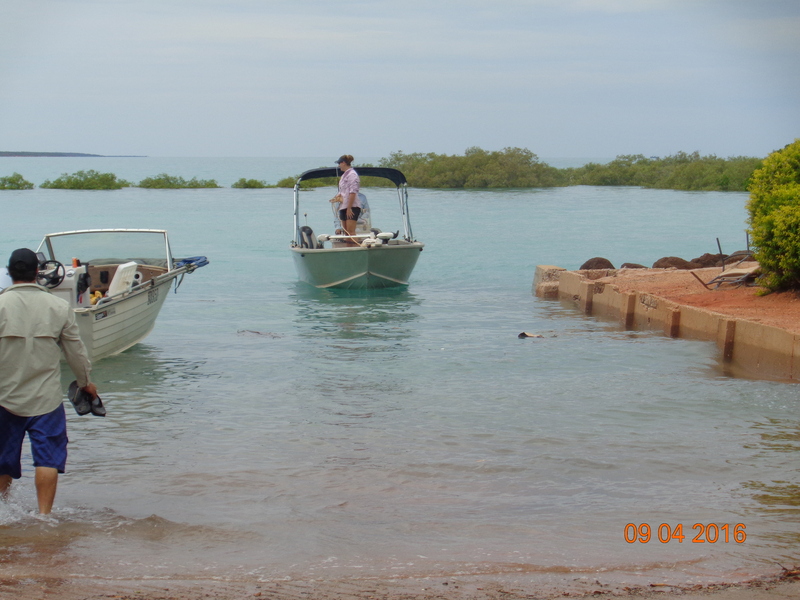 Broome Port reaches 38.2C, caused by the hot Easterlies. 4th April, at 11.16pm it was 34.8C, no flights but at 11.00am it was 33.9C and the same at 11.30pm. Then at 2.59pm, it was 35.6C maximum, dropping to 35.0C 1 minute later. No scheduled flights. 5th April, 35.2C at 11.57am, dropping to 34.5C at 12.00noon. No scheduled airline flights at the time. Up from 33.9C at 11.30am. The strongest wind gust was at 11.57am too. April 6th, 34.5C at 1.23pm, 2 arrivals at 1.20pm and 1.25pm. Just 33.3C at 1.00pm and 34.1C at 1.30pm and 32.6pm at 2.00pm after a few clouds roll in. April 7th, 39.7C at 1.56pm, dropping to 39.2C at 2.00 pm. Airline flight leaving at 1.50pm. Winds from S to SSE. April 8th, 35.7C at 12.59pm was the maximum, 2 flights arrived at 12.45pm and 12.50pm. At 1.00pm it was back to 35.4C, then 36.2C at 1.05pm, back to 35.4C at 1.30pm. Was 33.6C at 12.30pm. Winds are WNW backing to West. April 9 and 10, Easterlies showed just a small rise around the 10.30 to 2.30pm above the half hour records, with a maximum of 41C at 1.49pm on the tenth. Double the normal aircraft movements on weekends, and the biggest tides of the year, 10.5metres. April 11 and 12, Easterlies to South Easterlies kept the maximum hot, maximum of 39.8C at 2.00pm, the same time as a scheduled aircraft departure followed by another at 2.10pm. Still 39.5C at 2.30pm. High tide 2011, April 4th. April 13th, Maximum of 38.1C at 12,28pm. At 12 noon it was 36.9C and at 12.30pm it was 37.0C. Winds are SSE during that period. No airline flights at that time, but the helicopter hangars are directly influencing the SSE wind influencing BoM data. Now, I see a 38.3C at 1.11pm, the same time of arrival as a commercial flight. At 1.30pm it was back to 37.3C. April 14th, it reached 38.3C at 1.45pm. One flight arrival at 1.35pm, the temperature showed 37.8C at 1.30pm. At 2.00pm it dropped to 36.6C as the Westerlies arrived. 15th April, 2 flight arrivals, one at 12.45pm, another at 12.50pm, maximum temperature of 38.3 at 12.43pm. It was 36.8C at 12.00 and the same at 12.30pm, dropping to 37.4C at 1.00pm. Shortly after, it was 38.0 at 1.30pm, rising to 38.6 at 1.38pm. Winds SE to S, before SWesterlies came in to cool things down a bit. Flights departed at 1.35pm and 1.40pm. 16th to 18th of April, maximum temperatures around the middle of the day as wind swings from SE to SW of around 39C. No aircraft movements at close to those times of maximum temperature. 20th April, 33.3C at 1.48pm, just after an aircraft arrival at 1.40pm. It was 32.3C at 1.30pm and 32.1C at 2.00pm. Sky News show just 32.8C as a maximum. In fact all Sky News maximum temperatures for Broome are below what BoM shows us. 21st April, maximum 38.5C at 1.07pm, with an aircraft arrival at 1.10pm. The earlier temperature at 1.00pm was 37.9C and at 1.30pm was 38.1C. One more flight arrived at 1.20pm and another at 1.35pm. Winds SE to ESE, direct from helicopter hangars to BoM instruments. Sky News shows a maximum of 38.2C at 1.44pm. Then a later maximum of 39.0C at 2.58pm, dropping to 38.4C at 3.00pm. SE winds, and Sky maximum of 38.7C. 22nd April, it was 39.6C at 12.39pm, dropping to 37.1C at 1.00pm after 38.3C at 12.30pm. Winds from the East. Two flights scheduled to arrive, at 12.45pm and 12.50pm. Sky News maximum, 38.9C, well below BoM. 23rd April, earlier it was 39.6C at 12noon and 39.7C at 1.00pm and 1.30pm, dropping to 35.6C as the wind shifted from ENE to WNW. The maximum was 40.7C at 1.37pm, but no airline flights at those times. 24th April, from 11.00am to 1.00pm the temperature hovered between 37.3C and 38.3C, before a spike at 1.06pm to a maximum of 39.3C. Several aircraft movements in the same two hour period, but none within minutes to the hottest time, then falling back to 38.3C at 1.30pm. Winds changed during that last half hour from East to Northeast. April 25th, maximum 38.2C at 12.19pm. From 12 noon to 2.30pm the temperature varied between 37.1C and 37.6C, prevailing winds SE. No scheduled flights at the time of maximum temperature. Sky Weather maximum of 37.8C. 26th April, 34.4 at 12 noon, and 33.5 at 12.30pm. Maximum temperature hit 35.0C at 12.04pm. No flights scheduled at that time, with winds WSW moving to WNW. Sky Weather’s maximum 34.0C. 27th April, a maximum of 33.0C at 12.05pm. From 32.3C at 12 noon to 31.9C at 12.30pm. Winds SW to WSW, no scheduled aircraft movements. Then later 33.0C at 12.46pm, dropping to 32.3C at 1.00pm. Sky Weather’s maximum 32.6C. April 28th, 32.8C at 12.48pm was maximum temperature. It was 31.8C at 11.00am through to 32.2C at 12.30pm and 32.0C at 1.00pm. No scheduled flights. Sky News maximum says 32.2C. Winds, WSW. April 29th, 33.2C at 12.03pm maximum, and at 11.30am, 12noon, and 12.30pm it was the same 32.5C. No scheduled flights, winds WSW. Sky News maximum says 32.7C. April 30th, a maximum of 33.1C at 1.11pm. At 1.00pm it was just 31.9C and at 1.30pm, it recorded 32.5C. No flights at that time, winds constant westerly. Sky maximum 32.5C. Maximum temperatures are close to 1C above the half hourly figure throughout the month, suggesting that there is an outside influence on the brief increases shown here. Early in the month, those high temperatures coincided with airline arrivals and departures on several occasions. That was less evident during periods of East to NE winds when April’s usual heat pushed the average maximum above 38C on 15 days. Earlier in the year, the continuous NW to SW winds continually pushed the maximum temperature higher at similar times to aircraft movements. Sky News reported the maximum each day at the lower, half hour, temperature records. 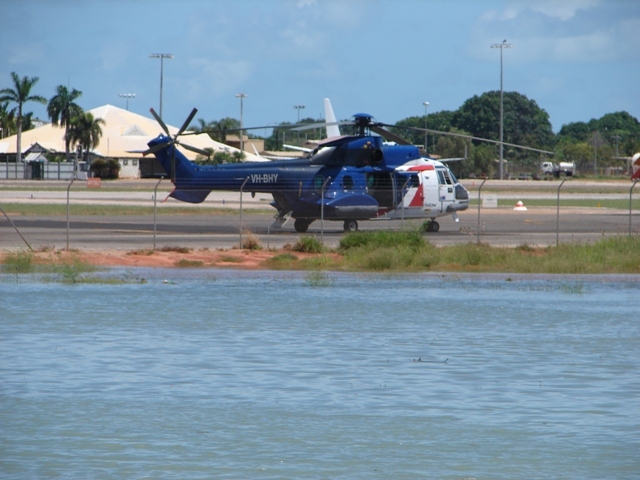 What is not considered, is the times of departure and arrival of any of the 15 giant helicopters that use the Broome Airport. their hangars are adjacent to the BoM site. This site is to the north of the runway and the airline apron and terminal is to the south. Roughly half of the maximum temperatures were within 10 minutes of arrivals and/or departures. […] In addition to creating some arcane mathematical tools useful for creating climate datasets, the team also found daytime high temperature data is less likely to be contaminated by surface issues — such as deforestation, construction, paving and irrigation — than nighttime low temperatures. Summer high temperatures are particularly useful in this regard, because summer temperatures tend to be more stable, while cold season temperatures are subject to larger swings due to natural variability. These often wild swings in temperature introduce “noise” into the data, which can mask long-term trends and their causes. I guess now I will have to go back and look at low temperature records. 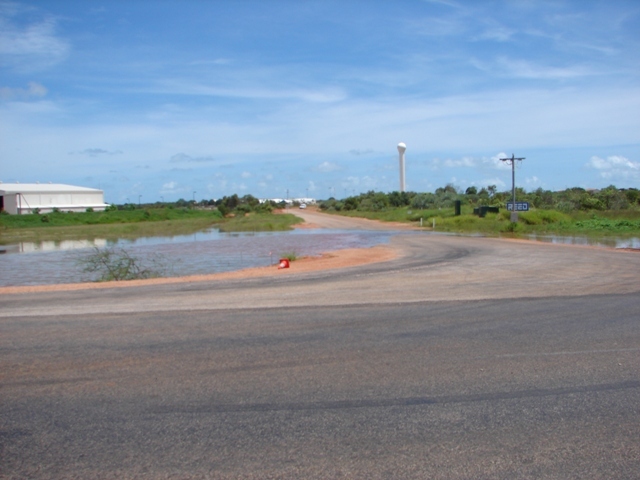 In Broome, those are less affected by airline traffic at night. Minimum for April 1981 was on the mean, but this year, about 2C warmer minimum temperatures of 24.7C. No rainfall during the month, and a lot more asphalt since 1981 may be part of a reason for the heat recorded, and of course, El Nino weather. This entry was posted in Climate, photography, weather and tagged Anthony Watts, bom, Broome, climate, climate change., Dr. John Christy, science, Sky Weather, weather. Bookmark the permalink.